Conducting medical rounds in a hallway rather than at the patient’s bed is a practice some experts criticize. Patient “rounds’’ — the crucial daily meetings when doctors and other caregivers determine treatment — often occur in hospital hallways and remote conference rooms. But a study led by Boston researchers concluded that it’s far safer to do rounds right at the bedside, with the full involvement of patients and families. 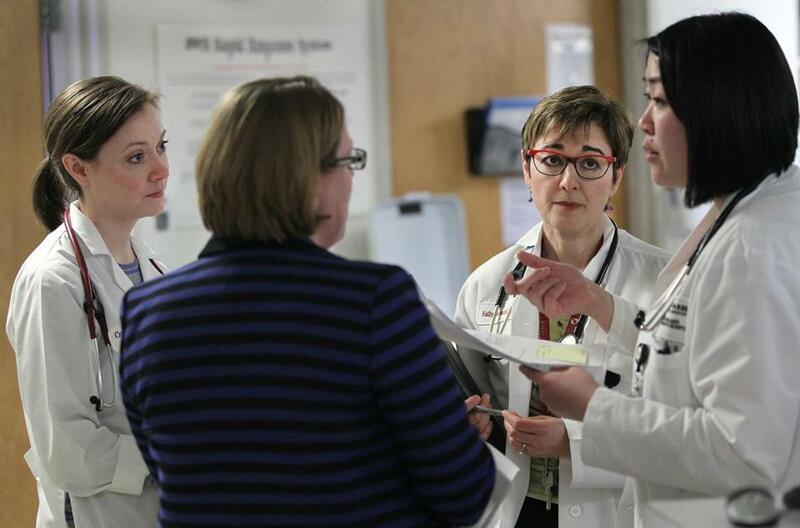 Researchers at Boston Children’s Hospital and seven other pediatric hospitals found that harmful medical errors fell by 38 percent when they moved rounds into patients’ rooms and implemented strict protocols to involve patients and families in the discussion. They included limiting medical jargon and providing written summaries of treatment plans. Numerous studies have shown that poor communication between doctors, nurses, and other caregivers is a leading cause of medical mistakes that hurt patients. But this is “the first multi-center study showing that when families get actively engaged, safety improves,’’ said Dr. Christopher Landrigan, senior author and research director of inpatient pediatrics at Boston Children’s. Boston Children’s did not participate directly in the study, which was published in Thursday’s British Medical Journal. The hospital tested the idea commonly referred to as “family-centered rounds’’ several years ago and has since implemented the program on its medical units, and overseen related research, Landrigan said. Many pediatric hospitals involve families in rounds but the quality and effort are uneven, and adult hospitals are generally further behind. (Landrigan and fellow researchers eventually plan to study the impact of family-centered rounds in non-pediatric facilities.) Doctors, residents, nurses, and medical students often conduct rounds in front of computers in corridors. Even when rounds are done at the bedside — when doctors need to do a physical exam or for the patient to answer a question, for example — patients and families are often just passive listeners who hear incomprehensible medical acronyms and abbreviations. A prominent nurse wrote this week in Catalyst, an online publication of the New England Journal of Medicine, that she was shut out of rounds after her husband fell off his bike and spent 10 days in an intensive care unit before he died. “I felt discounted during rounding and decision-making,’’ wrote Susan Hassmiller, a nurse and adviser at the Robert Wood Johnson Foundation, a public health philanthropy in New Jersey. Her husband’s “providers stood outside his room and talked at computer screens about data points, rather than meeting with us to discuss our goals and needs,’’ she wrote of her experience, which occurred two years ago at a hospital she declined to name. Hassmiller said she eventually insisted on being included in rounds, but that the practice is rare. She did not see other families participating, and a nurse told her that family members were not invited to rounds. Some hospitals, including Brigham and Women’s and Beth Israel Deaconess Medical Center in Boston, closely involve patients and families in rounds on certain units, according to Robert Wood Johnson. But Dr. Beth Lown, chief medical officer at the Schwartz Center for Compassionate Healthcare in Boston, said true family-centered rounds are uncommon. A countervailing force is underway, she said. Doctors spend less time with patients because of computerized medical records and demands to document every aspect of care, as well as the push to discharge patients as quickly as possible. Doctors worry that including patients in rounds will be too time-consuming, she said. As a physician, “you have a decision to make. If I ask this question am I going to end up in a deep conversation? Do I have that time? How many people are waiting in the waiting room? How many discharges do I have?’’ said Lown, whose organization’s mission is to improve the relationship between caregivers and patients. Landrigan, of Boston Children’s, said physicians are not reluctant so much as family-centered rounds are “just not on their radar. It’s easy to fall into the trap of ‘we are just going to do what is right’ ” for patients, he said. Caregivers might also worry about families hearing upsetting information. Or patients might be alone and too sick to participate in discussions. Time, he said, should not be a concern. The study found that the average duration of rounds did not increase significantly under the new protocol. It rose from 8.5 minutes per patient to 10.2 minutes per patient. Researchers also found that teaching residents and medical students did not suffer when families were involved in rounds. During the study, researchers surveyed families and reviewed medical error data for three months before standardized family rounds were implemented at the seven hospitals: SickKids in Toronto; Walter Reed in Bethesda, Md. ; St. Christopher’s in Philadelphia; Cincinnati Children’s; Primary Children’s in Salt Lake City; the University of California San Francisco; and Lucile Packard Children’s in Palo Alto, Calif. The overall rate of medical errors did not change much. However, harmful errors fell from 20.7 per 1,000 patient days to 12.9 per 1,000 patient days. Less harmful errors might not have decreased because they often involve incidents families can’t control, such as when a physician or nurse enters a slightly wrong dose in a an electronic medication system, Landrigan said. Serious errors, however, often involve symptoms that caregivers miss, leading to delayed diagnoses, or when medications patients receive at home or are allergic to are overlooked— all situations in which families can raise red flags, he said.